It’s not often we’re blown away by a destination these days. As in proper “OMFGCantBelieveMyEyes” blown away. But having spent a week exploring all of the best things to see and do in the Faroe Islands, it’s safe to say it’s a destination we’ll be talking about for some time. The raw and rugged landscapes of the Faroe Islands, an 18-island archipelago in the North Atlantic, are unlike anywhere we’ve ever been. Sheer, jagged cliffs rise straight from the ocean while windswept lands loom large all around. Colourful, grass-roofed villages dot the island's shores and mountains throughout, providing the most colourful, picturesque backdrop to an otherwise barren land. Driving from village to village and island to island was itself one of our favourite pastimes on the island. At every bend in the road, we became like giddy kids visiting Disneyland for the first time, excitedly staring in awe at our surrounds. Surprisingly, for somewhere so barren, there’s a heap of awesome things to see and do. 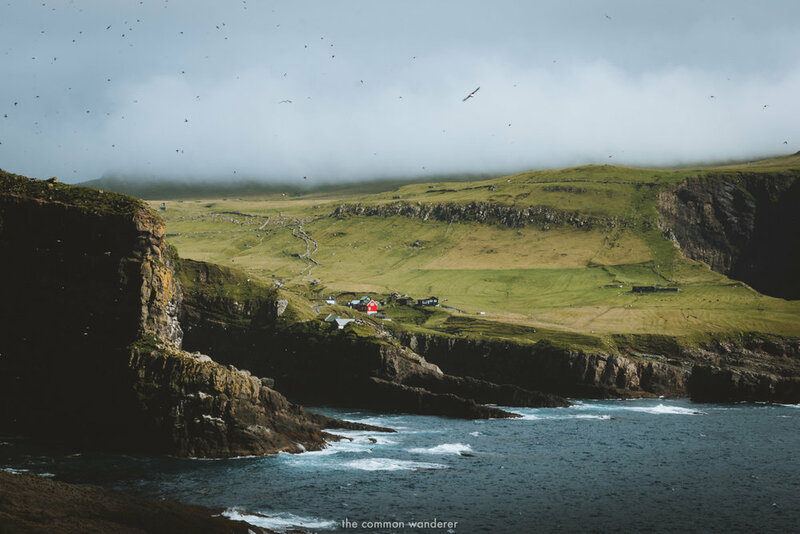 From epic hikes seemingly to the edge of the world to kayaking through the freezing North Atlantic waters, eating locally sourced produce at a Michelin starred restaurant to spotting endangered puffins, the Faroe Islands will leave you in absolute awe at every turn. These are our favourite things to do on the Faroe Islands, a great mix of natural and cultural must-dos that will have you leaving the islands with a head full of memories. In hindsight, our visit to the dramatic island of Mykines was probably the best experience we had on the Faroe Islands. Why? Puffins, and our incredibly knowledgeable guide, Heini. The most westerly island in the Faroes archipelago, Mykines (pronounces Mitch-en-ez) is the breeding ground for a wide range of migratory seabirds, including the incredibly cute and clumsy Puffin. The western-most section of the island is covered with Puffin burrows and seabird nests, transforming it into a hive of colour and sound in summer months. The walk to the lighthouse at the tip of the island is an absolute must and will provide you with the most incredible views of the island. It’s a fairly easy, albeit very hilly, 3-4 hour return hike and you'll pass through the Puffin nesting burrows as you go - so make sure you stick to the path at all times. If you have time, explore the local village, which once had a full-time population of 180, and now sits at around eight (full time). One of those former residents was Heini, whose father was the last lighthouse keeper on the island, and whose knowledge and deep passion for the island he lived on as a child was infectious and inspiring, and really made our time on the island an absolute highlight of our entire trip. To get to Mykines, take a local ferry from Størvágur, which, weather permitting, travels two times a day. Be warned though, it’s a pretty rough journey! Guided Tour | We highly recommend taking a tour with Heini from Visit Mykines. It costs DKK450 per person. 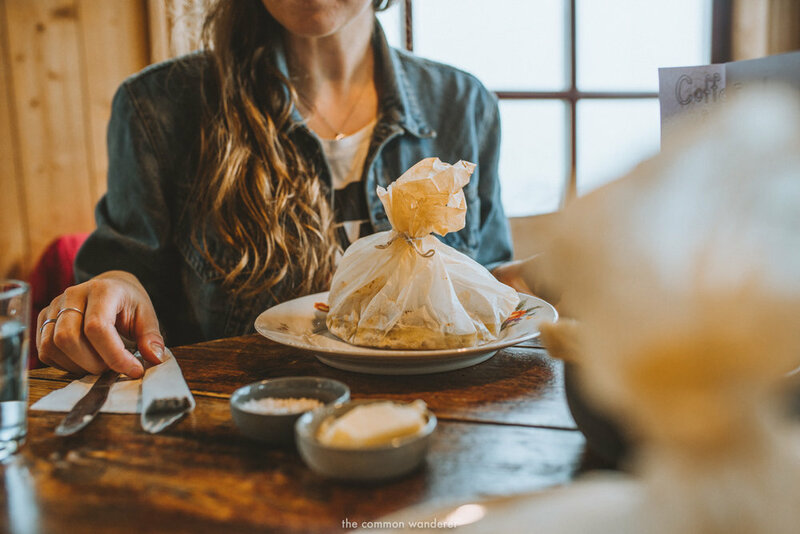 It's not often that a fine dining experience starts with a bumpy Landrover ride around a lakes edge and up to a quaint Faroese cabin, but KOKS isn't your regular fine dining experience. Helmed by young head chef/prodigy Poul Andrias Ziska, KOKS Restaurant is the Faroe Islands' first Michelin-starred restaurant. Located right in the heart of nature in a picturesque hidden valley (made even more beautiful on the day we visited by the thick fog rolling through the plains), the restaurant perfectly encapsulates what the Faroes are known for; isolation, natural beauty, and unique experiences. With a focus on locally sourced and foraged ingredients, the 18-course (yes, you read that number right!) meal with paired wines (paired juices available for non-drinkers) meal is a celebration of traditional Faroese food with a modern twist. Expect delicious seafood and vegetables along with some more uncommon, sometimes controversial, additions like whale blubber (we were running late and missed this course), and fermented lamb and fish. We don't generally consider ourselves 'foodies', though we absolutely adore a well-prepared and delicious meal (we have our upbringings in Melbourne to thanks for our slight snobbery when it comes to food! ), and to be completely honest we originally hesitated on going ourselves as we weren't sure it was our 'thing'. Don't make that mistake! In a world where unique experiences are becoming harder and harder to find, our meal at KOKs was truly one of the most wonderful, authentic, and unique travel experiences we've had in a long, long time. In fact, keep an eye out for our dedicated KOKS post coming soon! Book | Book your place here (note: reservations need to be made well in advance). Tip | Take a cab to the restaurant (about 30min from Tórshavn); alcohol limits for driving in the Faroes are 0. We'd seen the lake of Sørvágsvatn all over Instagram, but nothing prepared us for how beautiful this place is in real life. So beautiful in fact, we went back twice (and almost a third, if not for the weather!). Located on the island of Vágar, Sørvágsvatn is the largest in the Faroe Islands, famous for its optical illusion where the lake seemingly hangs over the sea below. The walk to the famous viewpoint begins in Midvágur and takes about an hour to get to the main point of interest - the view back over the cliffs and lake. The weather can be very changeable (like the rest of the Faroes), so pack warm clothes and a rain jacket just in case. The area is also famous for Trælanípa, a rock wall 142m above the sea which is supposedly where at one point in time, Vikings pushed their slaves off the mountain. These days, photographers -including us! - prefer to use it as the perfect point to snap photos of the incredibly rugged coastline. Right on the edge of Sørvágsvatn is Bøsdalafossur waterfall which thunders straight into the sea below. If the North Atlantic is at its most ferocious, it's an absolutely incredible sight to see as huge waves pummel the cliffs and the waterfall blows back into the lake. The area is completely open, so can be very dangerous in foggy/abject weather. Please always put your own safety above wanting to stand on dangerous edges to "get the shot!" "I can't believe we're here, seeing this in real life" uttered Mark, as we both stood opposite one of the prettiest sights we'd ever seen. Perhaps the most famous of all Faroese attractions is the stunning Múlafossur waterfall, located just south of Gasadalur village. Falling straight into the North Atlantic, the waterfall has become somewhat of an Instagram sensation in recent years and is one place we’re happy to admit is MUCH better in person. It’s utterly majestic. The village of Gásadalur sits in the middle of this beautiful scene of towering mountains and grass-covered fields, all of which are the perfect backdrop to the famous waterfall. The town itself is typically Faroese, with small, grass-covered homes and a distinctly remote feel. Until 2004, when a tunnel was built connecting the town to Søvágur, the town was only accessible via hike or helicopter. If you're looking to make the most of your time here, do what we did and spend a night at the Gásadalsgarður, a newly built guesthouse with a truly iconic view. It also doubles as a restaurant serving traditional Faroese fare. To get to Gásadalur and Múlafossur waterfall, head east from Vagur airport, through the town of Bøur and the tunnel before arriving. Then, it's a short walk down to the Múlafossur falls viewpoint. How to get to Gásadalur | Head east from Vágar airport, through Søvagúr, passing through a tunnel before arriving. Then, it's a short walk down to the Múlafossur falls viewpoint. The long, thin island of Kalsoy is located in the northern part of the Faroe Islands archipelago and is famous for Kallurin lighthouse, positioned on what feels like the edge of the earth, perched atop dramatic cliffs which just straight out of the North Atlantic below. The easy 1-hour hike to the lighthouse, and exploring a little of the island itself is a must-do on the Faroe Islands. Starting in the remote village of Trøllanes, head through the red gate, before following the faint path along the base of the imposing mountain, slowly snaking your way towards the lighthouse. We did our hike with Pøl from Hiking.fo, and were definitely glad for his expert guidance on the steep and sometimes slippery path! Definitely best to wear a pair of sturdy hiking boots for this one. The views from the lighthouse are some of the most incredible on the Island; sheer cliffs surround you from almost all sides, while in the distance you can see the edge of the northern and southern islands. You can walk out to a ledge to get the iconic photo of the lighthouse and mountain, but be warned - it's very windy, slightly precarious and once or twice we had to drop to the ground to avoid feeling like we might be blown over the edge! We also recommend stopping in the town of Mikladalur to visit the Seal Woman statue, and to learn about the folktale of how she is believed to still curse the men of the Island. 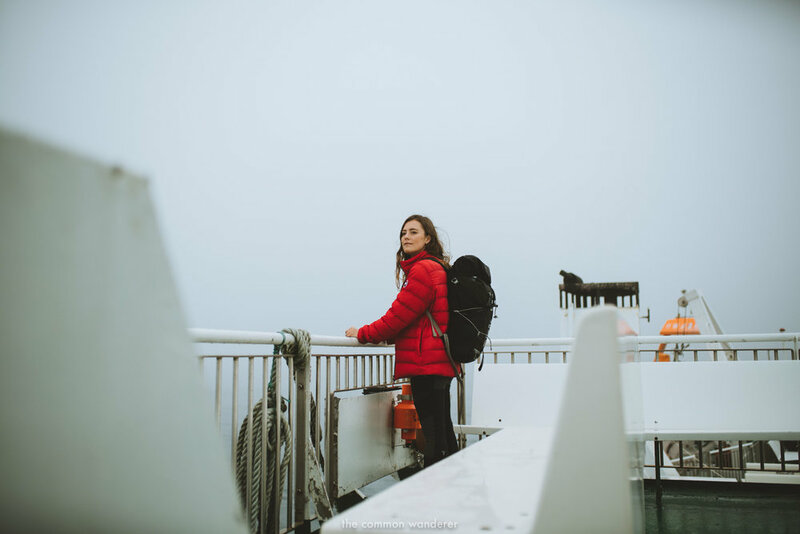 How to get to Kalsoy | Take a ferry from Klaksvik village. If you're taking your car across it can get very busy, so try to arrive at least an hour prior to your departure. Otherwise, if you're taking the bus from the ferry port on Kalsoy, you can take a local bus to Trøllanes. Guided Tour | Book your tour with Pøl from Hiking.fo here. Guided tours start around 400 DKK per person. Tips | As with everywhere in the Faroe Islands, be careful. The winds on Kalsoy are incredibly strong. On a foggy, wet day during our time on the Faroe Islands, we caught the ferry from Tórshavn to Nólsoy to enjoy a thoroughly different, albeit enjoyable day out. With our plans to hike to the Islands lighthouse thwarted by the incredibly thick fog, we decided to explore the town and its quirky, artsy, and liberal community. It was the perfect chill day to break up an otherwise pretty heavily outdoor based itinerary. We spent the majority of the day curled up inside the Nólsoy visitor's centre, a wooden cabin in the heart of the town, enjoying their delicious homemade food (the steamed cod and potatoes are amazing, and you simply must try the homemade waffles with rhubarb jam and cream), and enjoying being toasty warm while the fog danced over the sea outside. The centre also has a sauna which visitors are welcome to use. Although there's not a huge amount to see and do in a town of 250 inhabitants, a visit to the church is worthwhile, while there are a number of photogenic homes and boat sheds, as well as a lot of artwork dotted throughout the community. The port, in particular, had a number of beautiful murals. For those visiting on a clearer day than us, the hike to the Nólsoy lighthouse is highly recommended (14kms or 5 hours, starting in Nólsoy). The ferry to Nólsoy takes around 20 mins and leaves from Tórshavn harbour up to six times a day. How to get to Nolsoy | Catch the 90 ferry from Tórshavn harbour. Depending on the day, the ferry runs up to 6 times. Check out the departure times here. The Faroe Islands are dotted with beautiful little towns, and in humble opinion, Gjogv is the most picturesque of them all. Located on the northern tip of Eysturoy about 1.5 hours from Tórshavn, Gjogv (pronounced Jegv) is a village full of charm and visual appeal. Colourful timber-walled cottages dot the enclosed valley with a creek flowing straight through the middle of the town (in which the local kids were thoroughly enjoying swimming in during our visit!). Gjogv is, however, most famous for its scenic 200m gorge, which is one of the best natural harbours in the Faroes and for centuries supplied the town's once-thriving fishing industry. For the best view, we recommend hiking out to the left of the gorge and enjoying the views back over this beautiful little town. It's also worth checking out the town's church, which dates back to 1929. If you're after a true Faroese cultural experience, make sure you visit during July when the national day of Ólavsøka occurs. Ólavsøka has origins in Norway and began as a memorial feast for the Norwegian King Olav the Holy, who was killed in the battle of Stiklestad, in Norway, on 29 July, 1030. It's believed his death contributed to the subsequent Christianisation of Norway, and also the Faroe Islands. Each year, locals from all corners of the Faroe Islands descend on Tórshavn dressed in their colourful national Faroese costume for a weekend of festivities, including cultural, musical, and sporting activities, like the hotly contested national rowing race. Our visit to the Faroe Islands timed perfectly with the Ólavsøka and we're so glad it did. We spent the weekend joining in the festivities, walking the streets of Tórshavn, eating local food, listening to traditional folk music, and enjoying a beer or two in the main square. It was wonderful to see the local traditions alive and well and that everyone old and young was in the festive spirit. The celebrations conclude at midnight on the Sunday, when crowds gather in the town square to sing traditional Faroese ballads and take part in the traditional Faroese chain dance (otherwise known as Midnight Song). It really is an incredible sight (watch this video for an idea). Tip | Accommodation for the festival books up months in advance, so if you're planning to visit at this time, keep this in mind! One of the highlights of our trip was seeing the Faroes from a completely different perspective, from the water on a half-day kayaking expedition with North Atlantic Xperience (NAX). Starting in Hoyvik, a small village just north of Tórshavn, we followed our trusty guide Hans as we hugged the coastline and made our way south towards Torshavn harbour. We stopped off at various coves, including one with a small waterfall, and various kelp fields before slowly making our way back - stopping only to admire the incredible scenery on what was the best weather day we had in the Faroe Islands. Our guide Hans was a wealth of information, giving us a wonderful overview of the local area and its sometimes turbulent history. For those wanting to kayak, NAX offers kayaking tours in various areas of the Faroe Islands including Tórshavn, Bøur, Klaksvik, Kalsoy, Sundalagið and Funningsfjørður. NAX also provides all the necessary equipment, including kayak, dry bags, and drysuits able to withstand the cold waters of the North Atlantic (trust us, its cold!). After a week spent hiking the outer reaches of the Faroe Islands, spending time exploring the cute capital of Tórshavn was a welcome change. Tórshavn is located on the south-east coast of Streymoy, and home to around 15,000 inhabitants (yeah, it's pretty small! ), and while it might not be the most buzzing capital in Europe, it's definitely worth spending at least a day in. At the heart of it is Tinganes, the historical old town which dates back to the 1400s. Stroll through the narrow, winding lanes and passageways filled with quintessential Faroese houses - charming grass-roofed, timber and stone buildings which are still used by locals today. Tinganes is also home to the oldest parliamentary meeting locations in the world (dating back to the 800s) and is still home to the Prime Ministers office. A short walk from Parliament Point is Vestaravág, the colourful harbour area of Tórshavn, and home to a number of great restaurants, including Skeiva Pakkhus, which serves super modern Faroese cuisine in a tapas-like format. Make sure you try the smoked salmon, which in this part of the world, is absolutely incredible. It's also worth checking out Skansin, Tórshavn's old fort which dates back to 1580. Although not a lot remains today, it does provide a nice out to Nolsoy, and back towards Tinganes and the rest of Tórshavn. Located in an imposing natural amphitheatre and isolated Fjord is the isolated little village of Saksun. Home to 14 inhabitants, the village has become something of an Instagram sensation (much like the rest of the Faroes) in recent times. In our opinion though, Saksun is so much more impressive than the little cottage that made it so famous and is probably the most beautiful location on the Faroe Islands. We literally spent our whole time in Saksun with our jaw to the floor. The Fjord is home to a large tidal lagoon which, which when low, allows you to walk out to the headland. The walk is easy and very much worth it for some incredible views. The village itself is home to a church that was built in 1858, as well as a few grass-covered homes which are seriously photogenic. There are also a number of hiking paths which take you high above the village, providing incredible views of the Fjord and surrounds. There are also a number of picturesque waterfalls within the village. Unfortunately, in recent times many visitors have trespassed on private land to get 'the' shot of the insta-famous cottage. The farmer has become quite frustrated with photographers and tourists blatantly disregarding his property and this area is now out of bounds (we've even heard reports he shot a drone out of the air... you've been warned). Please respect his wishes and hike out to the lagoon opposite for an equally beautiful photograph instead. We didn't originally plan on visiting Fossá waterfall as it was a little out of the way, however, after a heavy early morning rainfall, we made the decision to drop in on our way to Gjogv. Standing at 140m high, Fossa is the tallest of over 18,000 waterfalls on the Faroe Islands. After heavy rainfall, it becomes like any you'd see in Iceland - roaring over the multiple tiers showering the surrounding area with a heavy mist. There's a short path you can follow to the base of the falls, however, if the falls are raging, it's almost impossible to reach this far. While the Faroe Islands are remote, getting to them really isn't as difficult as you might think at first glance of your Google Maps. Here are some of the ways you can get to the Faroes yourself! The biggest expense on the Faroe Islands is accommodation. We recommend staying in downtown Tórshavn and exploring the best things to do on the Faroe Islands from there. You can search alternative hotels and prices on HotelsCombined here. A bunk in a hostel starts at around £22, while a private room in a hostel will set you back about £45. Bládypi Guesthouse located in downtown Tórshavn is your best bet and can be booked here. Airbnbs are a great alternative if you're looking to live in a traditional Faroese cottage, and are slightly better value with a private room around the £45 mark, and an entire apartment £95+ per night (remember to use our code for £30 off your first Airbnb booking here!). For those keen on saving as much as possible, camping is your cheapest option - although not without its risks! With inclement weather being a regular visitor around here, you'll want to be adequately prepared for the wind and rain that it brings. Note: wild camping is illegal here, but there are a stack of official camping sites around the islands. Find out more here. Being made up of 18 seperate islands, you'd expect it would be hard to get around the Faroe Islands, however, we found it very easy. We'd definitely recommend hiring a car, which can be picked up and dropped off at the airport. The roads on the Faroe Islands are well maintained and easy to navigate, making it the perfect road trip destination. Almost all of the roads are paved and with only a few gravel exceptions. Roundabouts control the traffic in most cases (there are only 3 traffic lights in the entire country), and while a few of the roads are one-lane (with turnouts for passing), we never had any issues with heavy traffic. It's also worth nothing the speed limit is 80km/h on main roads, and 50km/h within urban areas. The Faroe Islands have a super efficient bus system. You'll be able to get to most places by bus, although for spots a little further out of the way (Saksun, for example), you'll either need to rent a car or find some buddies to carpool with. All 6 of the bus routes within Tórshavn are free, including one that travels to the nearby historic town of Kirjubøur. 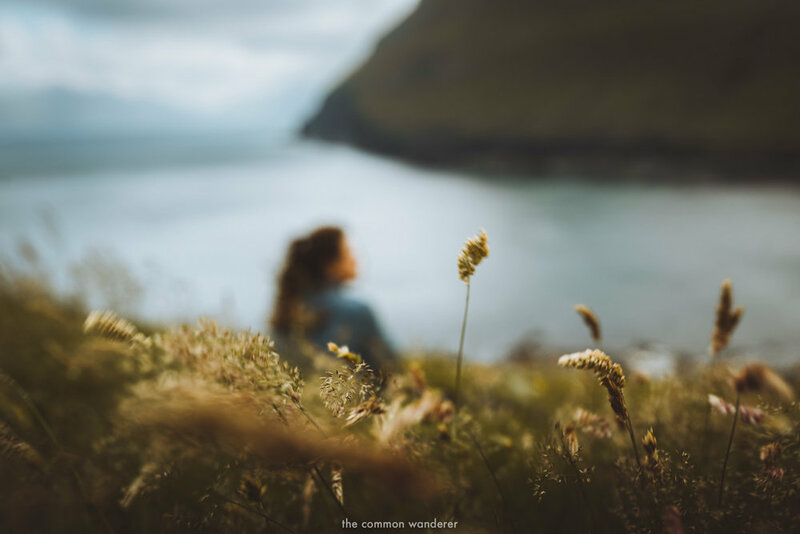 We'd recommend visiting the Faroe Islands in Summer, between July and August, when the weather is slightly more stable and the days long, allowing for more exploration. If you're more intrepid, the winter can provide incredible scenery, but with two-four hours of sunlight a day, we just don't think it's worth it. The Faroe Islands’ weather patterns are wildly unpredictable. In fact, there's actually a saying in the Faroe Islands that if you don't like the weather, wait five minutes - something we came to understand within the first few minutes of being there. Surprisingly, for somewhere so northerly and remote, the temperatures are reasonable. But despite their position in the North Atlantic, the Faroe Islands climate (at least temperature-wise) really is a pretty mild one. It does pay to have some flexibility in your planning, as ferries will get cancelled in poor weather conditions and your plans may shuffle around. Let us know your favourite things to do on the Faroe Islands in the comments below! Our time on the Faroe Islands was made possible by the support of Visit Faroe Islands and their respective partners. That said, all opinions - both good and bad! - are, and will always be our own.